Sugar, flour (wheat flour, malted barley flour, niacin, iron, thiamine mononitrate, riboflavin, folic acid), expeller pressed canola oil, cream cheese (pasteurized cultured milk & cream, cheese culture, salt, carob gum and/or guar gum and/or xanthan gum), buttermilk (cultured lowfat milk, condensed skim milk, salt, sodium citrate, vitamin a palmitate, vitamin d3), whole eggs, unsalted butter, glycerine, water, propylene glycol, fd&c red 40, fd&c red 3, vanilla, cocoa powder, salt, baking soda, vinegar.this product is manufactured on equipment that is shared with other products containing nuts. 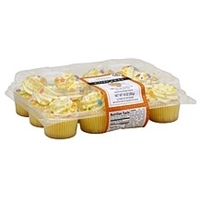 Cake & icing ingredients contain: sugar, soy, palm &/or canola oils, water, eggs, enriched bleached wheat flour (bleached flour, niacin, reduced iron, thiamin mononitrate, riboflavin, folic acid), butter. 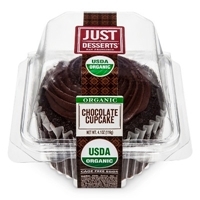 Contains 2% or less of: cocoa (alkali) corn syrup, modified corn starch, emulsifiers (mono and diglycerides, propylene glycol monoesters, datem, polysorbate 60, soy lecithin, sorbitan monostearate), salt, leavening (sodium aluminum phosphate, baking soda, sodium acid pyrophosphate), whey, dextrose, modified tapioca starch, nonfat dry milk, xanthan gum, tetrasodium pyrophosphate, calcium acetate, cellulose gum, guar gum, phosphoric acid, vital wheat gluten. If chocolate iced also contains chocolate liquor. Fillings & toppings may also contain: peanut butter (peanuts, dextrose, corn syrup, hydrogenated shortening (canola, cottonseed &/or soy oil), salt). Modified tapioca starch, emulsifier (propylene glycol alginate). 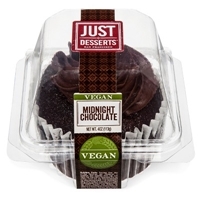 Partially hydrogenated soy, cottonseed &/or palm oils, nonfat cultured skim milk, high fructose corn syrup, raspberries, milk chocolate (sugar, cocoa butter, chocolate, nonfat &/or milk fat, lactose, emulsifiers (soy lecithin, pgpr)). Peanuts, sorbitan tristearate, cherries, rice flour, dextrin, dextrose, flaked corn, confectioners glaze, carnauba wax, carrageenan, gums (gellan, cellulose, tragacanth, arabic, xanthan). 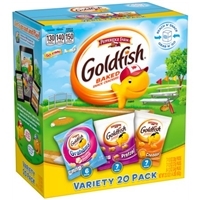 Natural & artificial flavor, artificial colors: titanium dioxide (fd & c lakes &/or dyes: blue 1, 2, green 3, yellow 5, 6, red 3, 40 red), preservatives (potassium sorbate, citric acid, sodium citrate, sodium benzoate, sodium propionate, tbhq sulfur dioxide). Sugar, water, bleached enriched wheat flour (flour, niacin, reduced iron, thiamine mononitrate, riboflavin, folic acid), vegetable (palm, soybean, palm kernel, canola), cornstarch, eggs, food starch-modified, leavening (sodium acid pyrophosphate, baking soda, monocalcium phosphate, sodium aluminum phosphate, aluminum sulfate), corn syrup, nonfat milk, egg white, mono- and diglycerides, salt, whey, potassium sorbate (preservative), wheat starch, soy lecithin, guar gum, polysorbate 60, polyglycerol esters of fatty acids, natural & artificial flavors, glycerin, gum arabic, sodium stearoyl lactylate, maltodextrin, wheat protein, datem, calcium stearoyl-2-lactylate, yellow 5, xanthan gum, sodium carboxymethylcellulose, methylcellulose, yellow 6, blue 1, red 3, red 40, dextrin, confectioner's glaze, yellow 5 lake, carnauba wax, vegetable color (annatto, turmeric).contains: milk, eggs, wheat and soy. Milkfat and nonfat milk, chocolate swirl (powdered sugar [sugar, cornstarch], soybean oil, cocoa processed with alkali, nonfat milk solids, coconut oil, soy lecithin, mono- and diglycerides, salt), cake pieces (sugar, wheat flour, eggs, margarine [liquid soybean oil, partially hydrogenated soybean oil, water, salt, soy lecithin, natural flavor, vegetable mono- and diglycerides, annatto and turmeric [color], vitamin a palmitate, whey], corn starch, natural flavors, soy lecithin, salt), corn syrup, high fructose corn syrup, sweetcream buttermilk, sugar, unbleached wheat flour, sugared egg yolks, sweetened condensed milk, contains less than 2% of whey, natural flavors, guar gum, mono- & diglycerides, xanthan gum, polysorbate 80, cellulose gum, carrageenan, annatto (color), salt.contains: milk, eggs, soy, coconut, wheat. ORGANIC BROWN SUGAR, ORGANIC POWDERED SUGAR, ORGANIC SOUR CREAM (CULTURED PASTEURIZED GRADE A ORGANIC MILK, PASTEURIZED ORGANIC CREAM, MICROBIAL ENZYMES), CERTIFIED ORGANIC WHEAT FLOUR, WATER, ORGANIC UNSWEETENED CHOCOLATE, ORGANIC WHOLE EGGS, ORGANIC EXPELLER PRESSED CANOLA OIL, ORGANIC BUTTER (CERTIFIED ORGANIC CREAM [DERIVED FROM MILK], CULTURES), ORGANIC WHOLE MILK, CERTIFIED 100% ORGANIC WHEAT FLOUR, ORGANIC COCOA POWDER (PROCESSED WITH ALKALI), ORGANIC INVERT SYRUP, ORGANIC VANILLA EXTRACT (WATER, ORGANIC ALCOHOL, ORGANIC VANILLA BEAN EXTRACTIVES, ORGANIC SUGAR), BAKING SODA, SALT, ORGANIC SOY LECITHIN, ORGANIC GUAR GUM. 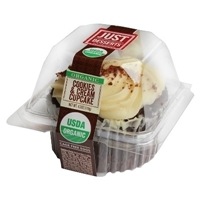 ORGANIC BROWN SUGAR, ORGANIC POWDERED SUGAR, ORGANIC SOUR CREAM (CULTURED PASTEURIZED GRADE A ORGANIC MILK, PASTEURIZED ORGANIC CREAM, MICROBIAL ENZYMES), CERTIFIED ORGANIC WHEAT FLOUR, WATER, CAGE FREE ORGANIC WHOLE EGGS, ORGANIC CULTURED CREAM CHEESE (ORGANIC SKIM MILK, ORGANIC CREAM, ORGANIC SKIM MILK POWDER, NON-GMO LACTIC CULTURE, L. ACIDOPHILUS, B. BIFIDUM), ORGANIC UNSWEETENED CHOCOLATE, ORGANIC EXPELLER PRESSED CANOLA OIL, CERTIFIED 100% ORGANIC WHEAT FLOUR, ORGANIC BUTTER (CERTIFIED ORGANIC CREAM [DERIVED FROM MILK], CULTURES), ORGANIC COCOA POWDER (PROCESSES WITH ALKALI), BAKING SODA, ORGANIC VANILLA EXTRACT (WATER, ORGANIC ALCOHOL, ORGANIC VANILLA BEAN EXTRACTIVES, ORGANIC SUGAR), ORGANIC TAPIOCA SYRUP, SALT, ORGANIC SOY LECITHIN, ORGANIC GUAR GUM, ORGANIC VINEGAR. 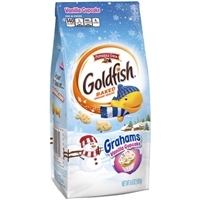 Brand/Manufacturer: Goldfish Campbell Soup Co.
Made with smiles and whole wheat flour, unbleached enriched wheat flour (flour, niacin, reduced iron, thiamine mononitrate [vitamin b1], riboflavin [vitamin b2], folic acid), vegetable oils (canola, palm kernel, palm, sunflower and/or soybean), sugar, cornstarch, brown sugar (sugar, invert sugar, molasses), invert syrup, contains 2 percent or less of: nonfat milk (adds a trivial amount of cholesterol), leavening (baking soda, baking powder [sodium acid pyrophosphate, baking soda, cornstarch, monocalcium phosphate]), natural flavors, salt, vanilla extract, corn syrup solids, corn flour, corn maltodextrin, cream (adds a trivial amount of cholesterol), blue 1, red 40, soy lecithin, turmeric extract and annatto extract for color.do not purchase if bag is open or torn. 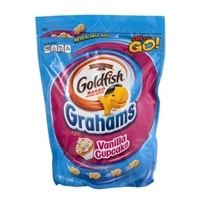 Cheddar goldfish crackers: made with smiles and unbleached enriched wheat flour (flour, niacin, reduced iron, thiamine mononitrate [vitamin b1], riboflavin [vitamin b2], folic acid), cheddar cheese [(pasteurized cultured milk, salt, enzymes), annatto], vegetable oils (sunflower, canola and/or soybean), contains 2 percent or less of: salt, yeast, sugar, spices, autolyzed yeast, leavening (monocalcium phosphate, ammonium bicarbonate, baking soda), and onion powder. 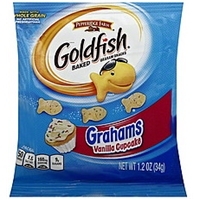 Pretzel goldfish crackers: made with smiles and unbleached enriched wheat flour (flour, niacin, reduced iron, thiamine mononitrate [vitamin b1], riboflavin [vitamin b2], folic acid), vegetable oils (canola, sunflower and/or soybean), salt, contains 2 percent or less of: leavening (baking powder [sodium acid pyrophosphate, baking soda, cornstarch, monocalcium phosphate]), nonfat milk (adds a trivial amount of cholesterol), malted barley flour, dextrose and wheat flour. 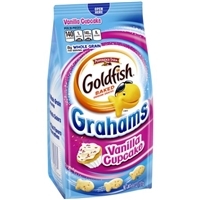 Vanilla cupcake goldfish grahams: made with smiles and whole wheat flour, unbleached enriched wheat flour (flour, niacin, reduced iron, thiamine mononitrate [vitamin b1], riboflavin [vitamin b2], folic acid), vegetable oils (canola, palm kernel, palm, sunflower and/or soybean), sugar, cornstarch, brown sugar (sugar, invert sugar, molasses), invert syrup, contains 2 percent or less of: leavening (baking soda, baking powder [sodium acid pyrophosphate, baking soda, cornstarch, monocalcium phosphate]), natural flavors, salt, nonfat milk (adds a trivial amount of cholesterol), vanilla extract, corn syrup solids, corn maltodextrin, corn flour, cream (adds a trivial amount of cholesterol), annatto extract for color, blue 1, medium chain triglycerides, red 40, turmeric for color, yellow 6 and soy lecithin.do not purchase if carton is open or torn. 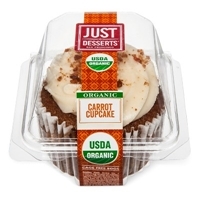 Made with smiles and whole wheat flour, unbleached enriched wheat flour (flour, niacin, reduced iron, thiamine mononitrate [vitamin b1], riboflavin [vitamin b2], folic acid), vegetable oils (canola, palm kernel, palm, sunflower and/or soybean), sugar, cornstarch, brown sugar (sugar, invert sugar, molasses), invert syrup, contains 2 percent or less of: leavening (baking soda, baking powder [sodium acid pyrophosphate, baking soda, cornstarch, monocalcium phosphate]), natural flavors, salt, nonfat milk (adds a trivial amount of cholesterol), vanilla extract, corn syrup solids, corn maltodextrin, corn flour, cream (adds a trivial amount of cholesterol), annatto extract for color, blue 1, red 40, turmeric (for color), yellow 6 and soy lecithin.do not purchase if bag is open or torn. 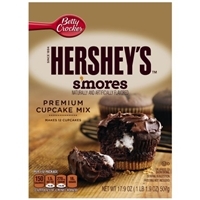 Made with smiles and whole wheat flour, unbleached enriched wheat flour (flour, niacin, reduced iron, thiamine mononitrate [vitamin b1], riboflavin [vitamin b2], folic acid), vegetable oils (canola, palm kernel, palm, sunflower and/or soybean), sugar, cornstarch, brown sugar (sugar, invert sugar, molasses), invert syrup, contains 1 percent or less of: leavening (baking soda, baking powder [sodium acid pyrophosphate, baking soda, cornstarch, monocalcium phosphate]), natural flavors, salt, nonfat milk (adds a trivial amount of cholesterol), vanilla extract, corn syrup solids, corn maltodextrin, corn flour, cream (adds a trivial amount of cholesterol), annatto extract for color, blue 1, medium chain triglycerides, red 40, turmeric for color, yellow 6 and soy lecithin.do not purchase if package is open or torn. 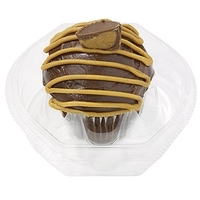 Milk chocolate flavored filling (sweetened condensed skim milk [skim milk, sugar, corn syrup], sugar, water, dextrose, hydrogenated palm kernel oil, cocoa processed with alkali, butter [cream, salt], modified potato starch, artificial flavor, cocoa, cellulose gel, hydrogenated cottonseed oil, salt, color added, datem, natural flavor, potassium sorbate [preservative], xanthan gum, baking soda), enriched flour bleached (wheat flour, niacin, iron, thiamin mononitrate, riboflavin, folic acid), sugar, cocoa processed with alkali, corn syrup, modified corn starch, partially hydrogenated soybean and/or cottonseed oil. 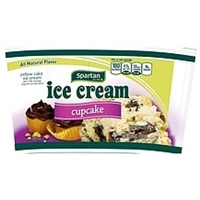 Contains 2% or less of: leavening (baking soda, sodium aluminum phosphate, monocalcium phosphate), corn starch, locust bean gum, propylene glycol mono and diesters of fatty acids, salt, nonfat milk, distilled monoglycerides, calcium acetate, dicalcium phosphate, sodium stearoyl lactylate, xanthan gum, cellulose gum, dextrose, artificial flavor.contains wheat and milk ingredients. 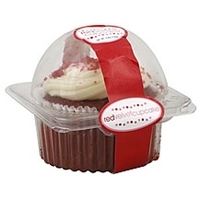 Marshmallow flavored filling (dextrose, water, corn syrup, sugar, palm oil, modified corn starch, cellulose gel, hydrogenated cottonseed oil, color added, salt, datem, mono and diglycerides, natural and artificial flavor, xanthan gum, potassium sorbate [preservative], guar gum, locust bean gum, citric acid, polysorbate 60), sugar, enriched flour bleached (wheat flour, niacin, iron, thiamin mononitrate, riboflavin, folic acid), graham crumbs (enriched flour [wheat flour, niacin, iron, thiamin mononitrate, riboflavin, folic acid], whole wheat flour, sugar, soybean and/or palm oil, high fructose corn syrup, molasses, honey, salt, baking soda), cocoa processed with alkali, corn syrup. 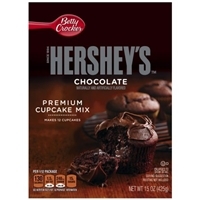 Contains 2% or less of: modified corn starch, partially hydrogenated soybean and/or cottonseed oil, leavening (baking soda, sodium aluminum phosphate, monocalcium phosphate), corn starch, locust bean gum, propylene glycol mono and diesters of fatty acids, salt, nonfat milk, distilled monoglycerides, calcium acetate, dicalcium phosphate, sodium stearoyl lactylate, xanthan gum, cellulose gum, artificial flavor.contains wheat and milk ingredients.